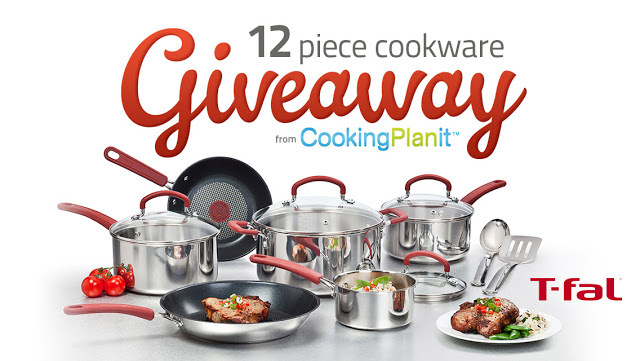 I know there has been quite the buzz going on all around the internet about this awesome giveaway from CookingPlanit and T-fal. CookingPlanit and T-fal have teamed up with 50 bloggers to give you all a chance to win this awesome 12 piece set of cookware! So let me tell you a little bit about it all. I can't tell you how excited I was to find this box on my doorstep? I was so giddy when I was asked to participate in this giveaway. First because it was an honor to be chosen among 49 of my favorite bloggers, and second because I was going to get to try this fabulous 12 piece cookware set from T-fal! I had a ratty old set of pots and pans that I bought quite some time ago. You know how it goes....I will replace them.....someday, and someday just doesn't seem to come. But then the foodie fairy smiles on you and you find this fabulous set of stainless steel and non-stick cookware on your kitchen table! It could happen to you...TRUST ME! Look at how gorgeous this set is. I felt like a little kid when I laid them all out. They were so shiny and brand new!! But it isn't all about looks with this cookware gang. They have tons of great features! The non stick surface is like none I have ever owned before. Plus, one of the coolest things, in my opinion, is the Thermo-Spot™ heat indicator shows when your pan is perfectly preheated. No more guessing if it is at the right temperature. You know with just a glance. One of my favorite features of the stainless steel pots is that the handles are riveted, not held with screws. How many times have you had handles get wobbly and loose because of the screws? Not anymore, they are soundly secured to the pot. They also have Interior measuring marks which is such a nice convenience. All of the cookware can go from stove top to oven, as you will see with the following recipe as well as these Pork Chops with Red Pepper Sauce. The non-stick up to 450 degrees, stainless up to 500, and all of the cookware is dishwasher safe. All in all I am absolutely tickles pink with this cookware, and I know you will be too!! Just take a look at this Tomato Bacon Frittata I made using it. I have always been afraid to try a firttata for the simple reason that I knew it would stick to the pan. Not with these T-fal pans. I simply ran my rubber spatula around the rim and slid it right out!! My giveaway starts on Sept 8th, so make sure to come back to enter then. But you still have plenty more opportunities to win before it is all over. Just check out these other fine foodies!! I was provided a 12 piece T-fal cookware set from CookigPlanit.com for this review and giveaway. However all opinions are my own! Ohhhh wow! Such gorgeous cookware! I love that center. I get annoyed when my husband throws tap water into the pan to test it's heat. If it's hot enough, the sprinkles leave crystals from the gross tap water! Plus, riveted handles?! MAJOR PLUS! Yup no more of that needed :) as soon as the words are all red it is ready to go! Well look at you with your new pans! I love TFall... such a nice set. YAY for you for being chosen out of 49 other bloggers. Very impressive. Thanks so much Terry :) I do love my new cookware!! Awesome kitchen stuff! It could be my family ladies' cooking heaven haha! Hehe yes I love my kitchen goodies!! I have heard nothing but good things about T-fal. It looks like an amazing set of cookware. Congrats. on being chosen for such an awesome giveaway. T-Fal does have nice stuff. I love stainless steel too. Enjoy your new pans! I like T-Fal cookware too! I had never used it before but I am a huge fan now! oh wow, I would love a new set of cookware like that! Only to the US though, too bad! ah so you are another one of my blog buddies who was chosen. What a wonderful set to get to review. Love it. So rooting for you Dawn!!! Thanks Akhil! I love them! nice set. Love stainless steel. Thanks Samantha :) followed you back! I love tfal! You are so lucky to got to do this! I know! I was so excited and I just love these pans! I love Tfal pans! I haven't seen this set yet or I would have already bought it. We need some new pans. I love the stainless steel pot that is something I would use a lot at my house. Make sure and keep entering to win the set. There are two blogs a day you can enter from until the end of the giveaway. This looks like amazing cookware. I will be remodeling my kitchen in a few months and would love this to go in it. You still have several opportinities to win them so good luck!! That looks like a great cookware set. I love that thermo spot so you know that its at the correct temperature. Congrats on owning such a great set. Thanks so much! Yes I love the thermo spot!! Cool stuff, Bobbi! Thanks for the review--I'm a cookware-aholic. LOL Pamela I know the feeling. I just feel like I can't ever have to much. My bf however feels a bit differently about the subject! I have looked at the T-Fal collection of pots so many times and just need to make the jump and buy them. Will look forward to your giveaway. Yes, I love them! Good luck!! What an amazing giveaway. I really need a new cookware set. WOW I wonder why :( thank you for sharing though! Thanks Viccy, I hope you enter as well. T-Fal is definitely the best brand of cookware out on the market! We have an older set that is still going strong! I know I Love them. I will never own another brand!